Amazon has officially launched Amazon Coins, and to kick off this new virtual currency the company has given out tens of millions of dollars worth of them. Announced back in Feb. of this year, Amazon Coins will be a new way for Kindle Fire owners to make purchases on their tablets. To get everyone used to the new system, all Kindle Fire owners have been given 500 of them – worth $5 USD – to kick off their purchasing. Additional coins can be purchased from the company at a $1 per 100 coins exchange rate, but the more you purchase, the higher the discount. For instance, 10,000 coins can be purchased at a 10 percent discount of $90. Amazon said that as of now the coins can only be spent on apps and in-app purchases, but it will be expanding the different ways you can spend them in the future. The company also added that there will soon be ways for you to earn coins, but no information was given on what exactly that would entail. Developers won’t be losing anything in these new transactions either. Amazon is saying that they don’t need to do anything to update their products to work with coins, and they will continue to earn 70 percent of all transactions as they currently do. Amazon is referring to this as “Day One for Coins,” and it should be interesting to see where the company goes with it from here. SEATTLE–(BUSINESS WIRE)–May. 13, 2013– —(NASDAQ: AMZN)—Amazon today announced that customers can now use Amazon Coins to purchase apps, games and in-app items in the Amazon Appstore and on Kindle Fire. To celebrate the launch, existing and new Kindle Fire customers in the U.S. have had 500 free Coins—a $5 value—deposited into their Amazon accounts today. For customers, Amazon Coins is an easy way to purchase apps and in-app items on Kindle Fire, and for developers it’s another opportunity to drive traffic, downloads and increased monetization. With discounts of up to 10% for purchasing Coins in bulk, it’s also an opportunity for customers to save money on their app and game purchases. Customers can purchase Coins by visiting amazon.com/coins. 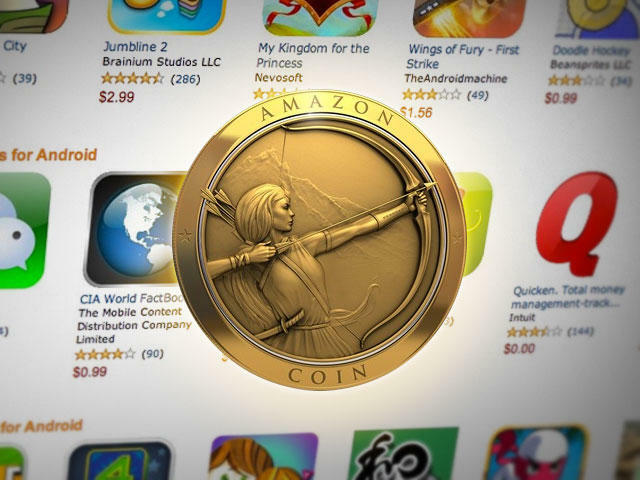 Amazon Appstore developers will earn their standard 70% revenue share when customers make purchases using Amazon Coins. No Coins-specific changes are required for developers with apps and games currently in the Amazon Appstore. Developers not yet in the Amazon Appstore should submit their app today through the Amazon Mobile App Distribution Portal (https://developer.amazon.com/welcome.html). App submission for distribution to nearly 200 countries globally enables developers to reach millions more Amazon customers worldwide. In-App Purchasing on Kindle Fire, Mac, PC and web-based games. This enables developers to sell virtual items in their apps and games while allowing their end users to simply use their Amazon accounts to make the purchase.